The tremendous economic, political and moral crisis that Venezuela is going through has not only sunk millions of people’s living and working conditions, but also the political programs that appear confronted to the death in a highly politicized stage. It is the hour of the lackeys. Both sides of the stand-off are in the service of big multinational capital, as bidders of the free exploitation of our enormous natural resources. The “pitiyanki” right, previously organized in the MUD (Democratic Unity) and now dispersed around Juan Guaidó, plays out a strategy that attempts to produce a change in government in Venezuela, from abroad. The open and impertinent manner that the foreign intervention is being carried out in unprecedented, with U.S. president Donald Trump and the pro-U.S. governments that promote Guaidó’s rise to power from the OAS and the Lima Group, supporting his self-proclamation as “interim president” and publicly calling for a military mutiny to carry him into office. The parties and social forces of this pro-yankee right once again demonstrate its position of lackey to U.S. imperialism, reviving in the 21st Century the treacherous and subjugated conduct that the parties of the Punto Fijo Pact (principally Acción Democrática and Copei) carried out from 1959. Juan Guaidó and his followers act as if following the instructions of a handbook written abroad by Latin American oligarchical governments grouped around their imperial master in the North. The huge mobilizations that have taken pace this Wednesday, January 23, promoted by the National Assembly as part of its plan to delegitimize Nicaolás Maduro, have an undeniable popular content and have been possible because of the widespread discontent of the people due to the brutal effects of the economic crisis on the living and working conditions of Venezuelan families. Given the absence of a classist, popular and revolutionary political alternative, the people have had no choice but to mobilize, once again, under the banners of the “pitiyanki” right, not to strengthen a political sector that they consider defeated and failed, but to make a new effort to remove those who they consider most responsible for all the wrongs that working people suffer from power. The lackeyism of the right that Joan Guaidó now leads, reaches the extreme of entertaining the idea of a scenario of foreign military intervention in Venezuela, which could unleash a civil was and bloodbath in which the people – as always – would pay dearly. In a political procedure of evident treason (and, for the record, I don’t at all agree with Maduro’s version of this concept of treason), Guaidó and the other pro-Yankee forces repeatedly promote foreign intervention, something rarely seen in our republican history. On the other side, the Maduro government has demonstrated beyond a doubt in these six years in government, its position as lackey to multinational capitalism, by carrying out openly neoliberal economic programs to exploit our main resources, like oil, gold and coltan. Maduro has signed contracts that copy the main anti-national companies that held previous oil concessions under dictator Juan Vincente Gómez in the second and third decades of the 20th Century. Maduro has also implemented economic plans inspired by neoliberal measures, like the flexibilization of labor relations as “bait” for attracting foreign inversions: unacknowledgement of work contracts in state companies; opening of special economic zones in which the labor laws of the LOTTT (labor legislation) are not applicable; suppression of union elections with the objective of illegalizing classist unions and imposing a union bureaucracy; military and police persecution of class-struggle union leaders, who have even been prosecuted by military courts (repeating this practice applied by Carlos Andrés Pérez in 1977); collapse of real wages to critical levels of poverty which places Venezuela among countries with minimum monthly incomes of $10 (the continent’s supposedly poorest country, Haiti, has a minimum monthly income of $80). Maduro’s program is lackey to the multinationals of the western world (U.S., Canadian, European), as well as of the emerging multi-polar globalization (China, Russia, Iran, Turkey). Maduro has no problem with embracing Manuel Rocha, ex official of George Bush’s State Department, now president of Barrick Gold, contractor of the Orinoco Mining Arc) in the presidential palace of Miraflores; of with giving interviews to the ultra-right Maria Eliva Salazar, of the neoconservative Fox News, to ask the chief of U.S. imperialism, Donald Trump, for dialogue. In fact, the breaking of diplomatic relations with the United States stands in stark contrast to that plea for “dialogue,” less than a week prior. The worst part being that any possible “negotiated” solution to the current crisis, implies forfeiting national sovereignty, since it would place the destiny of internal affairs that Venezuelans should resolve on our own, in the hands of foreign powers. From the first meeting of Elias Jaua with John Kerry in December of 2013, or the secret meetings of Diosdado Cabello with Thomas Shanon in Haiti in 2015, the Maduro government has maintained secret diplomacy with the U.S. government (which contrasts with its anti-imperialist discourse). This diplomacy has apparently cracked apart as the the contradictions between the main capitalist empire and other, equally capitalist economies like China and Russia, have sharpened. One of Maduro’s big mistakes was to tie us to the cart of the inter-imperialist confrontation that is brewing between United States and its western allies against China and its emergent capitalist allies. Like a joke that circulates in social media, the “gringos” come for our oil, gold, diamonds, iron, aluminum, coltan, etc. But the Chinese and the Russians are here for exactly the same things. They are not looking for mamones or guayabas. No one should believe that the powers that appear to back Maduro do so for ideological reasons of “solidarity” with the Bolivarian Revolution. Putin, Erdogan and Xi Jinpin could not care less if an ultra-neoliberal like Macri (with whom the Chinese government does very good business) or a progressive-leftist like Evo Morales, governs here in Venezuela. What the Chinese (and the rest of the “friendly” governments) care about, is to conduct business with us, because they have a global dispute with the West over the access to natural resources for their constantly growing industries. One thing is to use global geopolitical contradictions to obtain benefits for our country and avoid being trampled in the economic and political relations of the global order, by doing business with powers that are confronted with our traditional enemy in the North. Quite another thing is to make people believe that those economic relations with non-occidental powers are favorable for our country on their own. The Chinese and Russians simply conduct business with Venezuela. The more benefits they can get out of us, the more inversions will come. In the end, they operate under the same logic as global capital. And the anti-national contracts signed by Maduro with Gold Reserve and Barrick Gold have the same format as those signed with Chinese, Turkish and Russian companies. There is no doubt that the current crisis was generated by the government of Nicolás Maduro. In 2012, when Chávez died, the opposition was completely defeated electorally and the country’s economy was doing much better than the debacle we have gone through these last six years. Without denying that the roots of the debacle lie in fatal mistakes committed by Chávez himself, and recognizing that the political foundation of the PSUV-military government, with all its vices and perversions, were defined during Chávez’s time, it is necessary to state that Maduro developed all the bad and did away with the popular and revolutionary conquests of the Chavista process. The incapacity for running the economy and the huge corruption extended across the government, led the Maduro government to the complete failure of all the plans and all the goals lined out in its national plan. The cherry on the top was placed by Maduro when the PSUV lost the 2015 legislative elections, implementing a series of measures that violated the Constitution and ended with an arbitrary election to a constituent assembly, without a previous referendum. From there, Maduro, with the backing of the TSJ and the CNE, carried out a coup that violated the 1999 Constitution and inaugurated a de facto government, with phony elections, also conducted in violation of constitutional rule. This is why the legal situation of the Maduro government cannot be considered “constitutional,” but rather a de facto government, like that of Pérez Giménez, to reference the most recent example in our history (Pérez Giménez called his own “constituent assembly” and wrote his own constitution, which he nonetheless violated four months after approving it). The finishing touch has been the economic plan that the government has implemented since last August 20, which unacknowledges all the labor rights contemplated in the 1999 Constitution and the labor law of 2012, important conquests of the Bolivarian Revolution that Maduro has destroyed with the objective of making our labor force more attractive – cheap and without rights – to the savage investors of Russian, Chinese and other capitalist countries who are in “solidarity” with Venezuela. This is the hour of the lackeys. Guaidó and Maduro are both lackeys of global capitalism. Both are anti-national. Both act against the interests of the Venezuelan people. The political strategies of these two lackeys lead us to a possible civil war which would bring further calamity to our already suffering population. The very real perspective of situations of violence, which have already occurred this week, with the murders of almost 30 people in the protests held around the country. This violence, as well as the mutiny of National Guards that occurred in Caracas on Monday, January 21, does away with the only justification that the fraudulent National Constituent Assemble had left: having achieved a supposed “peace” and avoided a violent confrontation. It now looks like we have regressed, in even worse conditions, to the situation of violent repression of popular protests that took place in the first half of 2017. Maduro’s failure is evident, and Guaidó’s pro-Yankee submission simply contributes to deepening an unfortunate polarization that impedes working people from formulating a program of urgent transformations to overcome the economic crisis and stabilize the political debacle that we are living. 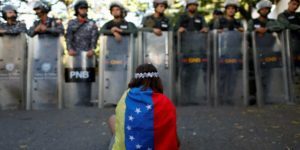 The demands of the Platform of Defense of the Constitution – a referendum to decide the calling of elections to reelect all public powers – appears to be the only viable proposal that can save Venezuela from armed confrontation that the extremists of Maduro and the equally extremist lackeys of the pro-Yankee opposition are planning. Originally posted at Anticapitalist Network.